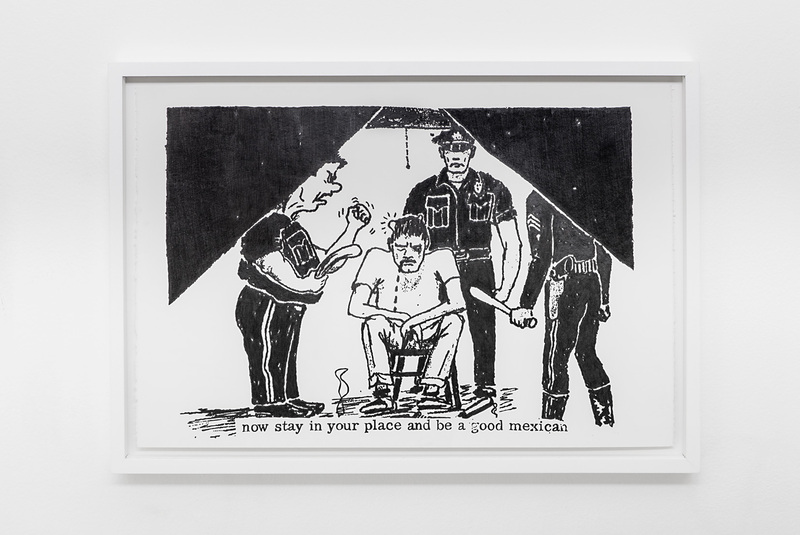 Andrea Bowers’s drawings elaborate a piecemeal, meticulously-drawn iconography of protest. Photographs and documents of emancipatory political struggle from different periods and places are reworked by hand, in something approaching an act of salvage.In light of the long and complex histories of art’s engagement with the political, and the many and various relationships between them that have been devised along the way, what does it mean to be preoccupied with images of political action? In this talk, this question is my starting point. To ask it is to begin to address the complex ways in which such images intersect with and shape processes of political identification and affiliation, and the desire for political agency. Bowers' works ask us to consider how renewed efforts of political imagination are informed by the often obscure histories of collective action. What attachments or detachment are played out in these drawings? What choreographies of binding and unbinding are traced in these lines? Protest Drawings by Joy Gerrard. As a spectacle of resistance, public protest has a long history and persists as a powerful form but is increasingly inextricable from its representation in real time, ‘citizen-enabled’ global media. My working processes and the final product reflect the volatility and unpredictability of the protesting crowd – and, conversely, the permanence of the architectural site within which it gathers. This work is based on painstaking archiving of media images of crowds over many years, generally the quickly passed-over ephemera of news reportage, Through drawing and painting I try to capture and reflect the human and affective power which condenses – and explodes – in these architecturally framed spaces. I think about aftermath; where might these images bring us? The events that brought us the images often still affect us in many and unexpected ways. How do we respond? 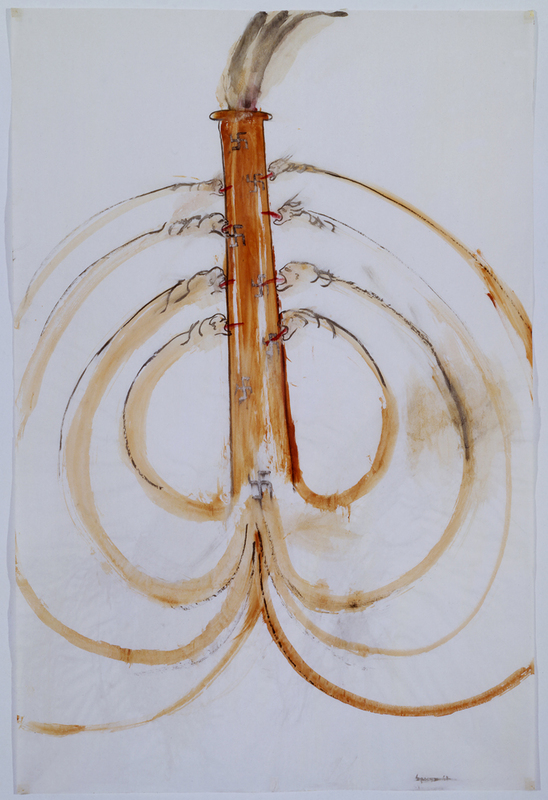 In 1966 having recently returned to America from Paris, Nancy Spero began War Series, a group of works that marked a change in her practice. Turning away from introspective and heavily worked canvases that dealt with themes of intimacy and distance in portraits of lovers and family groups, instead this new series was made quickly with gouache on paper, acrid colours and crude representation. Thematised around war, this series exploded on the page with violent, sexualised imagery designed to act as 'manifestos and broadsheets' against America's military action in Vietnam. In this talk, Warriner will consider the major themes of War Series in relation to the idea of witness, asking what kind of witnessing Spero enacts with these brutal pictures and how this can be understood in the context of her wider oeuvre. Hannah Ellul is a Manchester-based writer and artist. She recently completed a PhD in the department of Visual Cultures, Goldsmiths, University of London, where her research explored the relationship between drawing and documentary practices used by artists, and how drawing fits into discussions of what a politicised art practice might be. It is a project informed by the complex temporality and performativity of the image, and the intersections of historical and political consciousness in art. She received her MFA in Fine Art from Glasgow School of Art in 2010, and since then has she continued to develop work about radical political imagination and forms of collective experience. She is also part of the collaborative project Psykick Dancehall, working with sound: the politics of listening, recording technologies, and the voice. Joy Gerrard lives and works in London. She graduated with an MA and MPhil from the Royal College of Art, London. Recent solo exhibitions include ‘shot crowd ’at the Royal Hibernian Academy, Dublin (2017) and 'Protest Crowd', Peer UK, London (2015).Select group exhibitons include MAC International 2016, MAC International, Belfast (2016); 'In a Dream You Saw A Way To Survive and You Were Full of Joy', Hayward Gallery Touring (2016); and 'Contemporary Drawing', Xi'an Academy of Fine Arts, China (2015). She has installed numerous public installations since 2004 including at the London School of Economics (Elenchus/ Aporia, 2009) and Chelsea and Westminster Hospital (Assemble/Move/Map, 2012). Rachel Warriner completed her PhD in 2016 on the work of Nancy Spero at University College Cork. Her research was supported by the Irish Research Council. She has published on Raymond Pettibon and Spero, is on the editorial board of the Irish Association of Art Historian’s Artefact Journal, cofounded the Modernisms Research Centre, UCC and is co-curator with Pluck Projects. Currently she teaches on History of Art at University College Cork and Museum and Gallery Studies at the University of East Anglia. 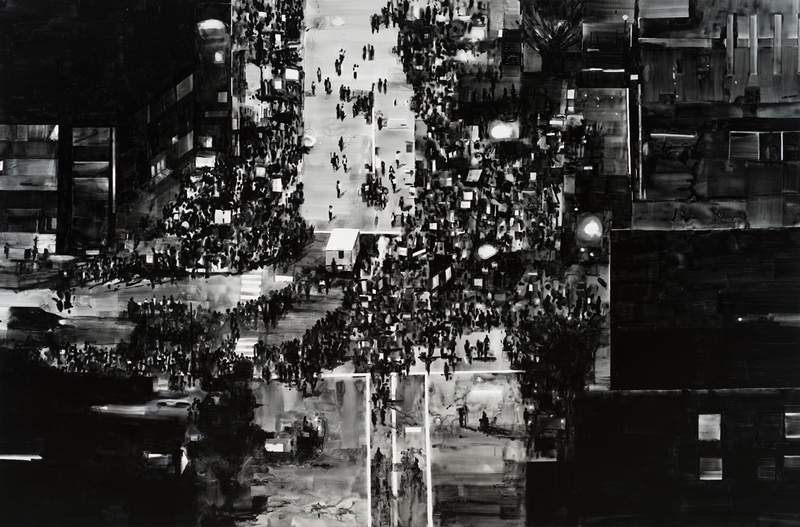 Joy Gerrard, Protest Crowd, Chicago, USA, Trump Rally (2016), 2017 Japanese ink on linen, 195 x 300 cm Courtesy of the artist.